Situated off the Atlantic Coast 21 miles south of Charleston, the Kiawah Island Golf Resort occupies virtually all of the 10,000-acre island from which it takes its name. Charles Fraser, famous for his sensitive development of Sea Pines Resort, laid the original plans for the resort, which opened in 1976. Roughly half of the island is to remain in its original state, and the variety of vegetation—some native, some planted—is impressive. Much of the development clusters near two resort villages—dubbed East Beach and West Beach—at the narrower western two-fifths of the island. Each of these villages contains restaurants, shops, and a golf course—though East Beach ups the ante by also having an elegant beachfront hotel, a Forbes Travel Guide 5-Star winner called the Sanctuary, and a spa, also a Forbes 5-Star winner, all just steps from a court complex named for the resort's longtime emeritus tennis director Roy Barth. The island's eastern end, by contrast, embraces many private houses and the two most famous golf courses, Osprey Point and the Ocean Course. An on-property shuttle makes going from place to place easy, so does an extensive network of bike lanes. The resort itself is close enough Charleston to make forays into the historic city easy—driving time is about 45 minutes—yet far enough removed that the island feels like a complete sanctuary. Nearly three decades after the first condominiums went up on Kiawah, the island's glorious 10-mile-long beach remains a nesting ground for endangered loggerhead turtle and its protected wilderness still provides a home for deer, raccoons, and more than 200 species of birds. But make no mistake about it: civilization has arrived in a big way. Though planned to be unobtrusive, two resort villages, five golf courses, an expansive racquet club—the former site of the U.S. Claycourt Championships and a Fed Cup tie—a 255-room hotel, and more than 1,000 villas and some 1,300 private homes now trail through a landscape where once there was only woods and marsh. As the name suggests, the resort puts great stock in its five golf courses. Each of the 18-hole layouts bears the name of a different architect. Gary Player designed and then redesigned Cougar Point. Changes took place elsewhere as well. Tom Fazio's Osprey Point got a drop-dead beautiful golf clubhouse and changes to Pete Dye's incredible links-style Ocean Course made it more friendly while also earning it a designation as an Audubon Certified Bird Sanctuary. Jack Nicklaus to reconfigure parts of his Turtle Point Course. The fifth course, Clyde Johnston's Oak Point, is in Hope Plantation just outside the entrance to the island. Not that tennis has been neglected. Until recently, there were two racquet clubs. Though only one remains, it is about to benefit from part of the $200 million being spent on enhancements to the resort. As part of that expenditure, the Roy Barth Tennis Center built 10 additional Har-Tru tennis courts, bringing its total to 22 (three of them hard and lined for pickleball). This sprawling complex benefits from its location near the Sanctuary, an award-winning hotel just a four-minute walk away. Until his retirement in early 2018, former touring pro Roy Barth had been the only tennis director the resort had ever known. But in one of the most seamless transitions ever, Barth handed the reigns to his son Jonathan, who himself had been head pro at the resort since 1999. Together they've carpentered together one of the country's foremost tennis programs, one almost perennially ranked No. 1 in our annual reader poll. The Roy Barth Tennis Center sits amid a halo of tennis villas four minutes on foot from the beachfront Sanctuary hotel. It was here that the Fed Cup matches were played in the spring of 1998, as were the U.S. Claycourt Championships in 1990. It has an expansive pro shop and is further distinguished by having one of its hard courts dedicated to a self-feeding ball machine capable of spewing balls at a rate of 1,200 per hour. The courts form a semicircle around the weathered wood pro shop, whose decks provide a comfortable place to watch the action. Winding paths through pine trees lead to courts variously bordered by palmettos, pampas grass, oleander and flowers. Each pair of courts has access to a awning-covered patio offering shade, benches, and an electric water fountain. Tennis Staff. Until his retirement in early 2018, former touring pro Roy Barth, one of the founding member of the ATP Tour, had been the only tennis director the resort had ever known. But in one of the most seamless transitions ever, Barth handed the reigns to his son Jonathan, who himself had been head pro at the resort since 1999. Together they've carpentered together one of the country's foremost tennis programs, one with a near lock on the No. 1 ranking in our annual reader poll. 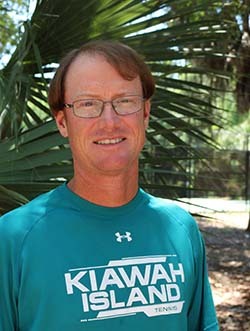 Roy's new title is Emeritus Tennis Director, a role that will allow him to continue to contribute and pass along his considerable teaching expertise. But management of the tennis operation now falls to his son Jonathan, who assumes the Director of Tennis title. The transition has gone smoothly, since Jonathan, who became head pro in 1999, has been a integral part of establishing and running the tennis programs. "Making major changes isn't my goal," he told me, "but I'm very excited about the efficiencies that will come from having all the programs in one location." That includes the summer Barth Tennis Academy that he helped found and is proud to say is "getting some traction." Tennis Programs. During the busy March-to-October season, the racquet club offers a weekly menu of programs including instructional clinics, two-hour Tournament Tough workouts, drill sessions, adult mixed doubles round robins, parent-child doubles round robins, and private lessons. In addition, the staff helps guests find opponents at the appropriate level, even guaranteeing a match if give 48 hours notice. Activity reaches its zenith in summer when the resort adds a weekly pro doubles exhibition at East Beach as well as three-day junior tennis camps, junior tournament tough workouts, and a Tiny Tots program. On selected weekends during every month except July and August, the resort adds a 3-day doubles mini camp, which consists of 8 hours of instruction covering all aspects of the game, including basic strokes, strategy, angles, visualization, and supervised doubles play. Participants also receive a copy of Barth's instructional manual, "Tips for Better Tennis." Finally, private camps can be arranged to suit the specific needs of a group. Barth Tennis Academy. The Barth Tennis Academy focuses on helping prepare junior tennis players for competition in state, sectional, and national level tournaments with an eye to preparing them for college play or even the professional circuit using a combination of match-play drills, supervised play, conditioning, mental toughness/strategy sessions, and technique assessment with video analysis. A day camp, it runs weekly for five hours a day from Monday through Friday during the summer. Court Fees. $35/hour for those who book accommodations directly through the resort or stay at the Sanctuary (packages with unlimited court time are also available); others, $45/hour. Beach. One of the great resort beaches in the country, this broad ribbon of hard-packed sand extends in a sinuous line for 10 miles along the entire length of the Kiawah Island. Although there are hundreds of villas and houses and that new hotel, all of this environmentally sensitive development has been pushed back behind a beltway of low dunes blanketed with foliage. No building is taller than five stories and all have earthen tones that blend with the surroundings. More than three decades after the resort opened, the beach remains pristine enough to endangered loggerhead turtles to nest there. And because the resort occupies the entire island, the beach feels private since there is never anyone strolling in from an adjacent property. Golf Courses. With five courses, each bearing the signature of a major golf architect, and a golf academy, Kiawah has obviously focused its attention on attracting golfers. That includes staging major golf events like the Ryder Cup in 1991 and the World Cup in 2003. The Senior PGA Championships will be held in May 2007 and the PGA Championships will be held in 2012. Golf packages, which include the right to make advance reservations for tee times, can be booked by calling 800-654-2924. Greens fees vary seasonally, highest in spring and fall, lowest in winter. Fees for resort guests who book through Kiawah Island Golf Resort are roughly 25% lower than those for outsiders. Cougar Point: Gary Player's 1996 redesign of the resort's original Marsh Point course, notable for its panoramic views of the Kiawah River and acres of needle rush and spartina grass. Water comes into play on 13 of its 18 holes, placing a premium on accuracy. Par: 72. Length: 6,875 yards. Turtle Point: Jack Nicklaus designed these 18 holes, investing the course with three spectacular oceanside holes: Nos. 14, 15, and 16. Site of the 1990 PGA Cup Matches, this low-profile course demands length and accuracy. Par: 72. Length: 7,061 yards. Osprey Point: A classic Tom Fazio layout, these 18 holes follow the contours of the natural canvas, skirting four large natural lakes, saltwater marshes, and dense maritime forests of century-old live oaks, pines, palmettos, and magnolias. Par: 72. Length: 6,871 yards. The Ocean Course: Pete Dye laid out these ego bruising fairways so that 10 ran directly along the ocean. Bordered by natural dunes on one side and salt marsh on the other, it is reminiscent of classic seaside links in England Scotland Par: 72. Length: 7,937 yards. During the summer of 2007, the Ocean Course opened a new $20 million clubhouse with views of the ocean and a new restaurant called The Atlantic Room. Oak Point: This Scottish-American style course lies a mile outside the resort in Hope Plantation. Built on the grounds of an old indigo and cotton plantation, it borders the historic Haulover Creek and the Kiawah River in a vintage Lowcountry setting of freshwater lagoons and winding creeks. Par: 72. Length: 6,759 yards. Spa & Fitness Center. The third floor of the Sanctuary houses an elegant spa with 12 treatment rooms. Modest in size, it nonetheless garnered a Forbes Travel Guide Five-Star rating in 2013. Guests looking to work out, meanwhile, have a small but well-equipped fitness center and indoor lap pool on the main floor of the hotel. And ... Night Heron Park is a 21-acre playground containing a 25-meter swimming pool with lap lanes, a wading pool, a full length basketball court, a soccer field, Parcours trail, playground equipment on a sandy base, a pavilion with a snack bar, an excellent nature center, and one of two bike rental outlets (the other at the Cougar Point Golf Clubhouse). Use of the park is complimentary to guests who've booked through Kiawah Island Golf Resort. There are three additional swimming pools, two at the Sanctuary, the other adjacent to the Cougar Point Golf Pro Shop. Nature Program. To better introduce the Kiawah's flora and fauna, local naturalists and historians conduct canoeing, kayaking, walking, and biking tours, including a few outings suitable for preteens. During the summer and over the major spring and fall holidays the resort operates its Kamp Kiawah program for children ages 3-11. Located at Night Heron Park, it provides a half day or full day of supervised activity, dividing children into groups ages 3-5, 6-8, and 9-11. For teens, there offer a specialized set of activities including late-night movies, basketball and volleyball tournaments, dances, and pool parties. That is all supplemented by organized family activities which could be movies, cookouts, ice-cream socials, or whatever. Modeled on the Lowcountry's grand seaside mansions, the 255-room Sanctuary at Kiawah Island strives to feel more like an tasteful residence than a typical luxury hotel. Of course most residences don't have 255 rooms, every one with a balcony or terrace and views of the mounded sand dunes and the Atlantic Ocean beyond, let alone a spa, fitness center, retail shops, several restaurants, and a couple of swimming pools, including one edgeless pool for adults only. Yet for all those amenities, it exudes the individual character and soul-pleasing comfort of a boutique hotel. Moreover, it is only a five-minute walk from the Roy Barth Tennis Center. The alternative is to book a villa. They range in size from one to four bedrooms. Prices vary according to size and location, with the most expensive fronting the ocean. All have fully equipped kitchens. Windswept, which has elevators and many rooms with sweeping views of the ocean, is one of the more appealing complexes if you want to be near the beach. One peculiarity of all the villas, however, is that they are individually owned and decorated, not always in ways that may coincide with your own tastes. Kiawah Island Golf Resort operates more than a dozen restaurants and lounges and one market, all located on the island. The newest addition is the Ocean Room at the Sanctuary for sophisticated preparations of seafood, aged beef, and coastal specialties coupled with sweeping ocean views. Also noteworthy is Jasmine Porch, a Lowcountry bistro also in the Sanctuary, with walls of authentic Charleston brick, oak-plank floors, windows on the ocean, and an outdoor terrace. Accommodations on Kiawah Island consist of a luxury hotel called The Sanctuary (877-683-1234), one-to-three-bedroom villas, and three-to-six-bedroom luxury homes ranging in size from one to three bedrooms. Prices vary seasonally and by location. Discounts are available for midweek stays and stays of 4 or more nights. Booking through the resort, as opposed to a private owner or real estate company, brings a number of added benefits including discounted court time, tee times, Kamp Kiawah discounts, complimentary use of the resort's swimming pools, and preferred access to the golf courses, tennis facilities, and recreation programs. Seasons. Although the resort operates year-round, winters can be cool and activity at the tennis center slows. Spring, summer, and fall are thus the busiest seasons. Average high temperatures range from the low 60s in December and January to the high 80s in July and August. Travel Instructions. By Air: Kiawah Island Golf Resort is 35 miles from Charleston International Airport. Rental cars and limousine service are available from there to the resort. By car: From the north, follow I-95 South or I-26 East to I-526 West. Stay on I-526 to 17 South until you reach Main Road (about 5 miles). Turn left onto Main Road and follow the signs to the resort. From the south, take I-95 North to 17 North (Charleston Exit 33). Once I-17 turns into a four-lane highway, continue another 9 miles and then turn right onto Main Road and follow the signs to the resort. General Tourist Information. For general information about Charleston and the surrounding area visit the Charleston Visitor Reception and Transportation Center website or contact them at 375 Meeting St., Charleston, SC 29403. Phone: 800-774-0006.